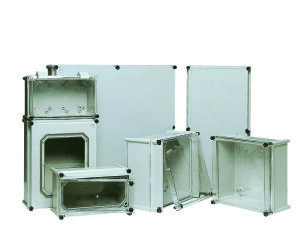 CE-TEK’s APO series of GRP enclosures are available in 9 popular sizes Each large APO enclosure is a multiple of the smaller size based on 300 mm and 185 mm modules, which allow enclosures with 2 or 4 open sides to be joined together. Finished in grey (RAL 7035) APO enclosures are available with opaque lids (to IP67 as standard and to 150ºC) or transparent lids (in polycarbonate to IP66 and to 120ºC). The smaller size APOs are also available as IP68 enclosures for shallow depths. Optional extras include: open side bases to allow modular panel building, mounting plates, end plates, pole and wall mounting brackets, hinges and cover hinges, air vents, security locks and many more.